“‘It became necessary to destroy the town to save it,” the unnamed officer told Peter Arnett of the Associated Press (and later CNN) in 1968. By “destroy,” the army meant bomb the town into another universe, regardless of civilian casualties. That, the military decreed, was the only way to rout the Viet Cong, whose killing of 12 South Vietnamese soldiers there in 1959 began the Vietnam War. Leveling Ben Tre, as it turns out, made it the city it is today. With nothing but flat earth left, the town started with a fresh slate after the war. But it wasn’t until the completion of the Rach Mieu Bridge in 2009 did things really begin to change. The province is now home to nearly 2 million people and the provincial capital is rapidly urbanizing and growing. Ben Tre, however, is still a beat off the beaten track for tourists, giving it a smaller-town feel with life still lived very much around the Mekong Delta. But that is changing quickly, too. 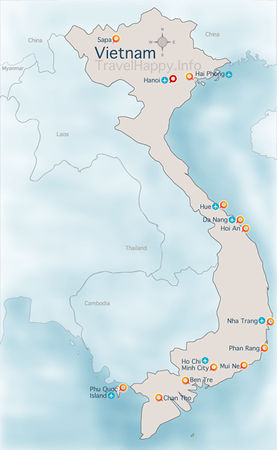 Hotels are popping up all along the banks of the Tien Giang River’s tributaries, fueled by Chinese and Russian money. As in Can Tho, traditional rural life still persists beyond the concrete overpasses and six-lane thoroughfares. Unlike that city, though, much of this is becoming tailored to tourism, particularly the region’s signature coconut-candy factories. As in Can Tho, there are a few established hotels in the Ben Tre downtown area, such as Hung Vong and the Ham Luong Tourist Hotel. And while a homestay sounds attractive, here the best choice in accommodations is out of downtown in a modern hotel run by a New Zealander and his family: the Oasis. This place gets rave reviews and has become a reason in itself to visit the area. Proprietors Ken and Lieu have been back in Vietnam for 15 years after raising the family in New Zealand. Ken has traveled most of the country and can point out not only the best sights to see in Ben Tre, but in your following destinations as well. The hotel also has an icy pool and arranges the requisite boat tours using guides who (mostly) take you to places that aren’t simply tourist traps. The hospitality and experience of the Oasis is a highlight for many travellers through Vietnam. As is the case through much of the Mekong Delta (Can Tho & Chau Doc in particular), boat tours are the centerpiece of a visit to Ben Tre. Starting around 8:30 a.m., the tour uses the boat more for transport to different land-based stops than for waterborne sightseeing. 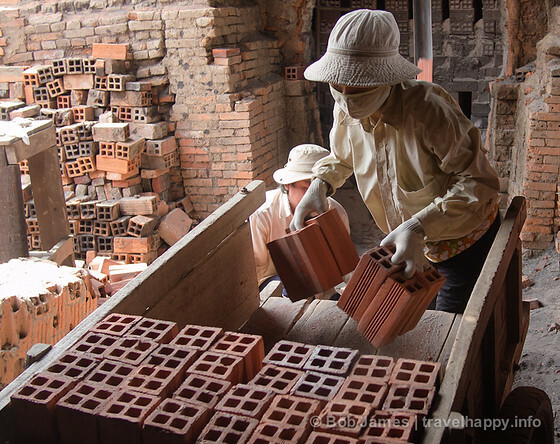 You’ll stop at a brick factory, where women load up handcarts of red-colored bricks from stacks taller than them, and then at a processing factory for Ben Tre’s most-famous export, coconuts. 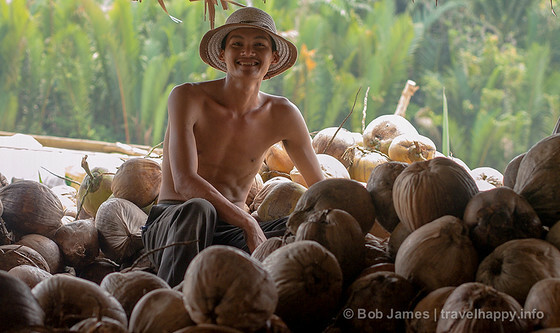 Workers here use every part of the coconut. Its husk is sold off as fuel for brick masonries and rice mills, its milk poured into tanks and shipped out via boat and the meat packaged for candy production, among other uses. The work in the factories is entirely manual, with sharp knives and big muscles as the only tools. Most tourists zip through Ben Tre on day tours and usually for only one reason: coconut candy. But the traditional way of making the semi-sweet cubes using open-flame hearths is quickly giving way to electric frying pans only turned on when tourists arrive. After a quick demonstration, guests are hurriedly pushed toward the gift stand. Critics say women working here don’t even have the skills to control an open flame anymore. The tour next pulls up at the bank and guests are issued bicycles, offering the most-authentic look at Ben Tre life. You’ll pedal down narrow lanes through farmland, stopping for a peaceful lunch alongside one canal where you’ll roll your own spring rolls and pick apart large local fish with chopsticks. The tour resumes with a switch to a smaller boat, as the first is too large for the backwater canals. But it’s hardly missed. The quiet of a single paddle on this jungle cruise is deafening. Paddling through these small, silent jungle backwaters , it’s impossible not to imagine what it must have been like for U.S. soldiers patrolling these same canals. The foliage here is no longer primary jungle and large houses can occasionally be seen through the trees, but it’s close enough. Unlike in Can Tho, no one lives along the riverbanks here. A single coconut factory was spotted. The water here is more remote and the jungle denser than to the west, so it simply serves as a nice end to the half-day tour, which eventually dumps out onto the busy Tien Gang where the modern world quickly reappears. 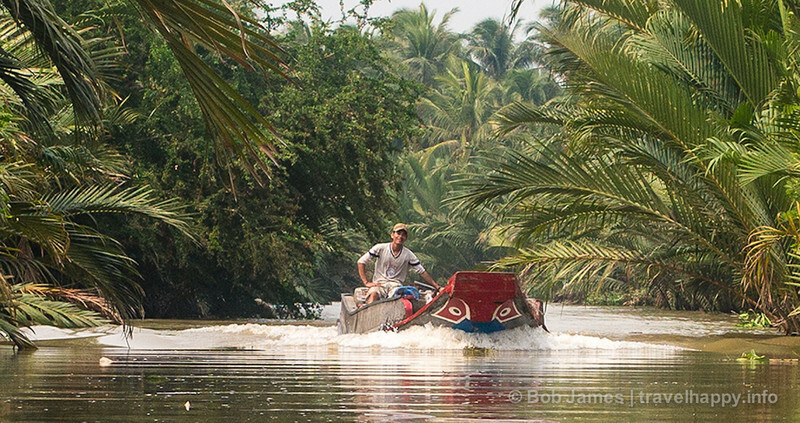 It’s easy to understand why most tourists breeze through Ben Tre in a day. The province itself has limited attractions. But the hospitality (and experience) at the Oasis makes it worthy of a longer stay. Ben Tre’s location makes it easy to visit other provinces and come back to a first-rate hotel, which is why you’ll meet many guests staying up 4-5 days at the Oasis, using it as a jumping-off point for the eastern Mekong Delta.